With MaxBulk Mailer you will create, manage and send your own powerful, personalized marketing message to your customers and potential customers. MaxBulk Mailer HTML allows you to include graphics, fonts and colors turning your messages into professional online brochures. Now your promotional messages will jump off the screen! MaxBulk Mailer handles plain text, HTML and styled text formats and gives full support for attachments. 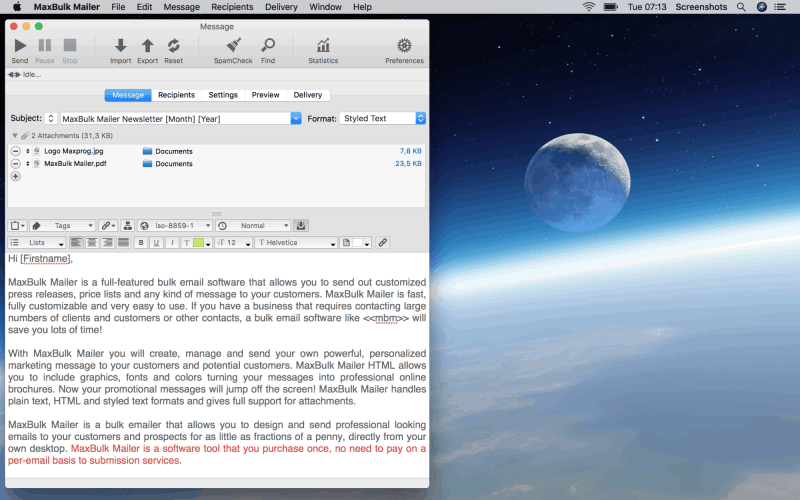 MaxBulk Mailer is a bulk emailer that allows you to design and send professional looking emails to your customers and prospects for as little as fractions of a penny, directly from your own desktop. MaxBulk Mailer is a software tool that you purchase once, no need to pay on a per-email basis to submission services. 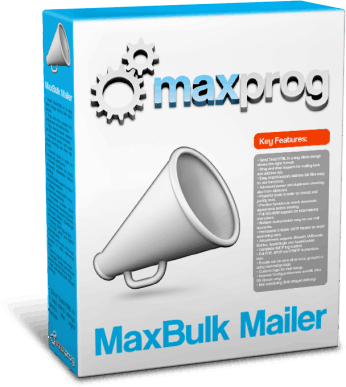 MaxBulk Mailer is available in English, French, German, Spanish, Italian, Dutch, Portuguese, Swedish, Japanese, Russian, Chinese and Korean for both macOS and MS Windows systems. Here is a breakthrough tool that will allow you to increase your profits, strengthen your customer service and send your messages to new markets. You'll be able to reach everyone in your database without worrying about integration or compatibility issues. MESSAGE FORMAT - Depending on your needs you can simply compose a plain text message, add styles like colors, fonts, size, bold, etc or even paste HTML code from your favorite web page editor. In addition you can mix styled text with HTML or even send HTML using the URL of an online page! LIST MANAGER - MaxBulk Mailer comes with a very complete built-in list manager that lets you do almost anything you can imagine. You can create as many lists as you wish, unsubscribe recipients and even add them to a blacklist to make sure you will never send unwanted messages! CUSTOMIZATION - Effective messages are the ones that contain recipient information. MaxBulk Mailer offers all kind of tags for data insertion so you can easily insert the customer name out of the 24 available recipient tags or the date, delivery or list information. If no data is available for a recipient just set a default value! MESSAGE PREVIEW - Previewing and testing your message is the only way to be 100% sure about what your recipients will get. MaxBulk Mailer offers a full preview of your message along with a test mode you can activate whenever needed to simulate a delivery and get that preview to your inbox! DELIVERY STATISTICS - Sending email to offer your services or products is great but it is even better if you can find out who actually opens and reads your messages. MaxBulk Mailer supports click-through and message opening tracking. You can very easily know what happens to your message after it leaves your computer! In addition ​MaxBulk Mailer also supports both inline and online attachments, conditional statements, mySLQ, OBDC and PostgreSQL imports, 40 charsets including Unicode UTF-8 and UTF-16, SSL authentication, Cc (Carbon copy) and Bcc (Blind carbon copy), a server account manager, delivery reports and detailed connections logs, delivery staggering and scheduling, an advanced recipient selector, an hyperlink manager and a random word generator. ​Anybody running a mailing list over the Internet will find MaxBulk Mailer a very helpful tool to get its e-mails properly delivered. Anyone can utilize its full lists of contact information with MaxBulk Mailer being able to reach everyone in a database without worrying about integration or compatibility issues. 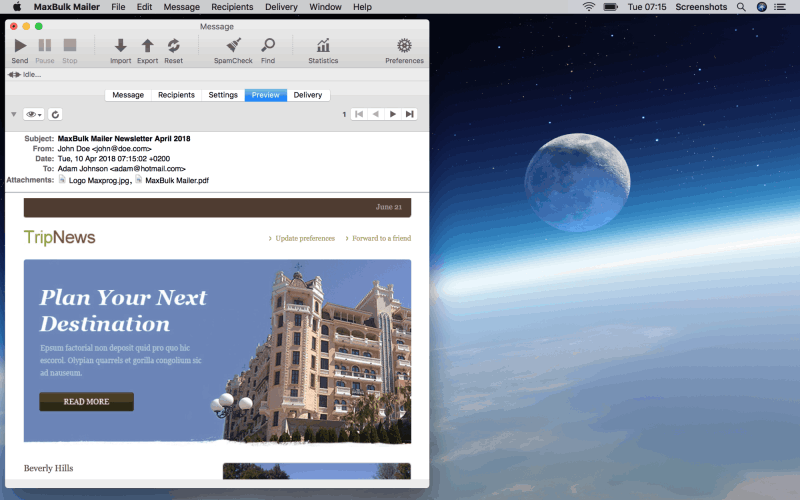 With a push of a button you can e-mail your newsletter, price list, quote, sales update, invitation etc. to hundreds, even thousands of people – each one personalised with information from your database. Think about that precious commodity - your valuable time (or that of your staff) when you eliminate some of the printing, folding, stuffing, mailing, phoning, faxing from the daily routine. With the email merge features in MaxBulk Mailer, and your existing online newsletters, it’s never been easier or more effective. Nice, Clean App! - "We spent a month downloading, testing and comparing many bulk mail programs. We even tried turning one of our computer into a dedicated listserv. We finally settled with this great program for a simple reason: P O W E R!" The most cost effective and easiest solution - "Every once in a while I get a piece of software that does everything right, and is just a pure pleasure to use. MaxBulk Mailer X is such a piece of software. Last night I found out that I had to send an individually addressed mailing to 550 people for my non-profit (V-Day). I downloaded the software, everything behaved exactly as expected, and I got the mailing out. The software made it totally easy"
I've used MaxBulk Mailer for several years now, and it's been a very reliable tool - "Promoting freelance services is hard. We needed a way to market our services and show off our design talent without paying a fortune. We also wanted to be earth-friendly. Used responsibly, email marketing has proven an incredible success. When compared to all other advertising avenues we’ve tried, we’ve received the highest ROI for the lowest investment through targeted, professional email promos. The Maxprog Email Extractor allows us to quickly gather targeted contacts and reach a wide audience. 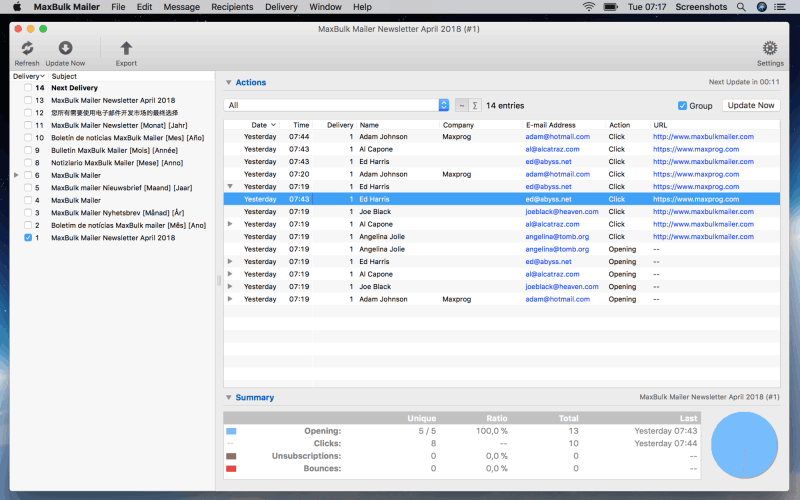 The MaxBulk Mailer has been, by far, one of the best software purchases we’ve made - period! The software is user-friendly, mac-compatible, and extremely reliable. Plus, MaxBulk is always one step ahead of our ISP. So, we can always stay within quota. I recommend this software to all of our clients!" This software saved my business! - "We use MaxBulk Mailer to send email to a couple of (opt-in!) mailing lists for two nightclubs... It's fast, has a simple & modern interface. If you are trying to maintain a list for mailouts, this program is full-featured, speedy, and crash free. And CHEAP to boot"
A real and powerful software - "I think this is great program. I just downloaded and sent myself a test mailing. Very Easy to set up. I am going to use this for my e-business mailing list for new product updates and sales. I have over 1300 names and we only use e-mail addresses if customers have placed an order with us or requested information"
Thanks to its advanced mail-merge and conditional functions you can send highly customized messages and get the best results of your campaigns. You also have support for international characters, a straightforward account manager with support for all type of authentication schemes including SSL, support for importation from a wide range of sources including from remote mySQL and postgreSQL databases. MaxBulk Mailer is not an email program like Mail, Entourage, or Outlook. But rather it allows you to use email distribution lists from these email programs or other databases to send individually customized messages to each address on the distribution list. With MaxBulk Mailer you can create, manage and send personalized marketing messages to customers or potential customers. Your activation key is delivered by e-mail right after your purchase. 30-Day Money-Back Guarantee included! Feel free to download and try MaxBulk Mailer! MaxBulk Mailer is being developed and marketed by Max Programming, LLC. also known as Maxprog®. 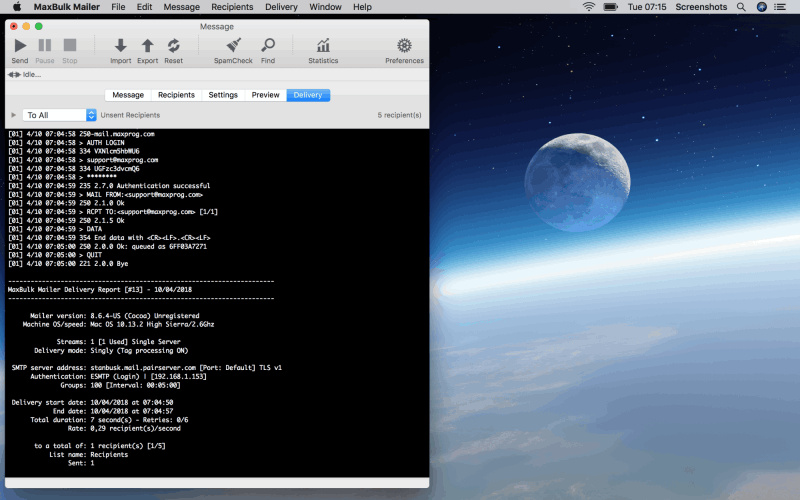 Maxprog is a privately held company based in Spain dedicated to macOS, MS Windows and Linux software development. Max Programming mainly develops and markets Internet, communication and database tools. Max Programming is unique in its approach to business, especially when it comes to customer care and satisfaction. In fact, our goal is to give each customer the utmost in personal attention and service. Max Programming, LLC was founded in the early nineties by French-born programmer Stan Busk, after over 15 years of experience in the high-tech networking industry and computer software development, now Chief Executive Officer of the company. Since its creation, Max Programming has built firm business relations with thousands of clients from over 136 countries with products localized in up to 14 different languages like English, French, German, Spanish, Italian, Russian, Japanese, Chinese, Dutch, Swedish and Portuguese. eMail Verifier is a tool for verifying e-mail addresses. It can verify both single e-mail addresses and lists allowing you to determine 70-80% of "dead" e-mail addresses. eMail Bounce Handler is a bounce e-mail filtering and handling tool that recognizes bounce emails, electronic mail that is returned to the sender because it cannot be delivered for some reason.